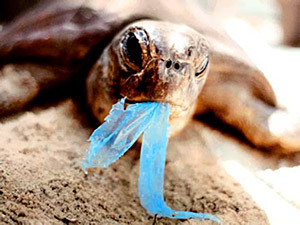 “Say No To Plastic Bags”… Please! After our trip to the Gulf last August where we delivered the supplies we collected for the Animal Rescue efforts, it became clear to us that it wasn’t enough for us to just try and save endangered species, we also needed to help clean up the environment so all the animals would have a clean place to live. We learned that the number one pollutant item in our oceans was plastic, and that plastic accounts for the death of over 1-million birds and over 100,000 marine animals including Sea Turtles, Seals and fish. We also learned that America uses an estimated 1,000,000 single use plastic bags every minute and that the average shopper in the U.S. uses around 500 single use shopping bags each year. And the worst part is, in most cases we don’t even need these bags. If we just tried, we could dramatically reduce the amount of plastic that we use which ultimately ends up in our landfills, and or oceans were it can sit for over 500-years. So as we returned, we vowed to find a way that we could try and make a difference. Since single use plastic bags are more of a convenience than a necessity, we decided to reach out to some of the best organizations we could to seek help and guidance. After months of research and education, we came to the conclusion that although the tasks seems overwhelming, we needed to just draw a line in the sand and make a stance and just Do-It. 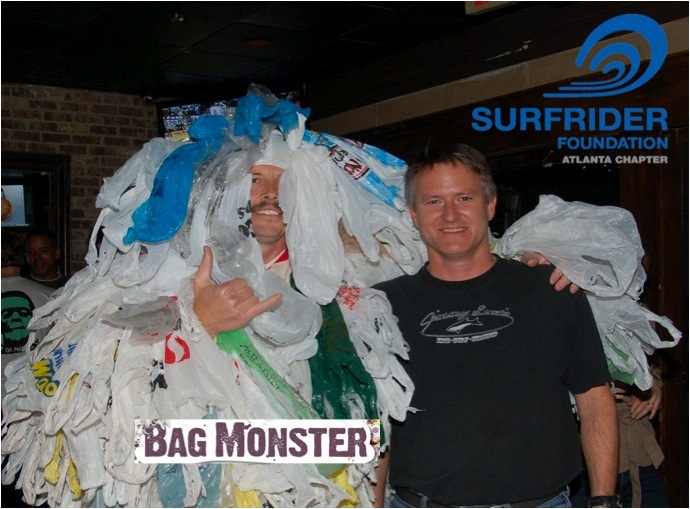 We are proud to announce that OMG founders Carter and Olivia have just launched the “Say No To Plastic Bags” Coalition and to celebrate we brought along the Bag Monster for his Atlanta debut. As we prepared for the launch of our “Say No To Plastic Bags” Coalition, we contacted countless organizations both locally and nationally in an effort to see where we could find support with this huge undertaking. We will be working with each of these organizations closely in the coming months to raise awareness in our local communities about the harm Single Use Plastic Bags have on our environment and on all living things. We purchased the movie rights to the award winning “Bag-IT” movie and we are in the process of scheduling public viewings in various communities so we can further educate all the concerned citizens in our area who are looking for ways that they can make a difference. Our first viewing is scheduled at GA Tech University for April 18th. We will post more details soon. Together with some of the coalition groups, we have already planned several public events where we will be featuring our very own “Bag Monster” in an effort to create awareness and to seek support from local community leaders so we can start dialogue towards finding the best solution for curing our dependency on plastic bags. Also check out what singer Gregory Brown created to help get the word out about how bad plastic bags are for our environment and our health. We are all very excited about the tremendous opportunity we have before us and about the tremendous effect our efforts will undoubtedly have on our environment, and on all the animals affected. We wish to thank each of the Coalition members and also the many folks working with us behind the scenes who are helping us make a difference. If you would like to be part of out efforts, or would like to join our coalition, please fell free to send us an email at the address on the top of our website.